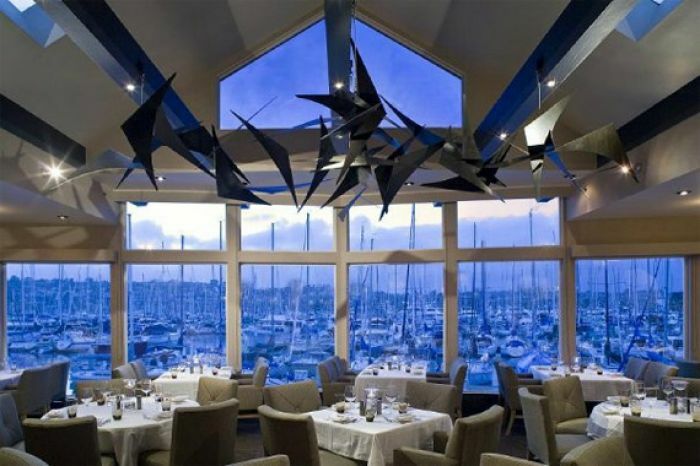 San Diego’s Humphreys by the Bay, located amidst the seafaring climate of Shelter Island, may be best known for its lovely marina setting and for its long history of hosting some of the world’s most celebrated musical talents. However, a few steps away from the 1,400 seat outdoor theater and inside Humphreys Restaurant you will find Executive Chef Paul Murphy, the man beneath another pillar of Humphreys’ success— fine dining. Behind the restaurant’s zebra wood tabletops and ceiling high windows overlooking the boat-filled harbor is where Chef Murphy captains the Humphreys kitchen. Chef Murphy ensures that the menu contains a well-rounded offering of seasonal dishes that explore both global inspiration and sensory innovation. In celebration of Humphreys by the Bay’s 2012 summer concert series, I was invited to attend a dinner hosted by the talented Chef Murphy, showcasing the restaurant’s range of culinary offerings. 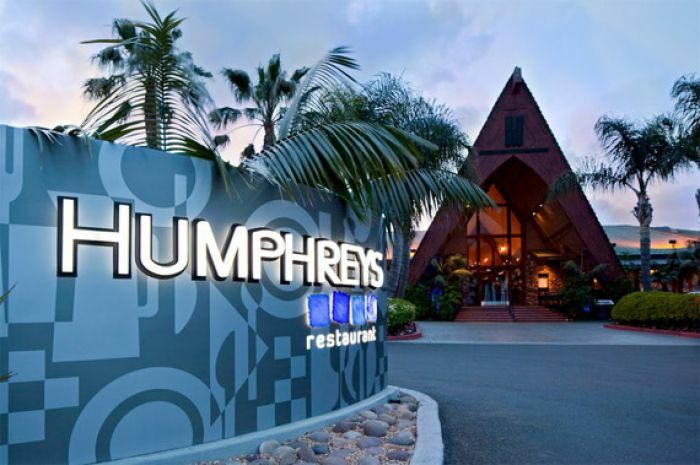 Because of the restaurant’s location, Humphreys is a beautiful place to enjoy an evening meal. When we arrived, the sun was beginning to set over the marina, casting pastel shadows across the hulls of the shipyard’s anchored boats. 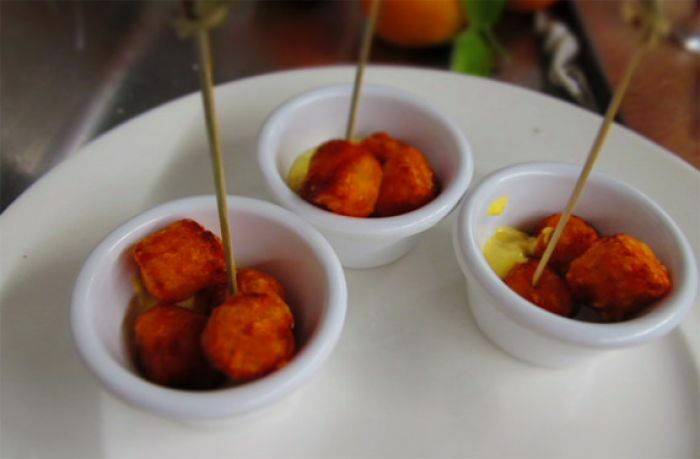 It was my first trip to Shelter Island, and while I savored the last bits of waterfront scenery as the day ended, we were invited to sample a few of Chef Murphy’s hors d'oeuvres, which included oyster shooters, sweet potato tots, and sesame-basil hummus. True to their name, the oysters were served in a shot-sized glass and delivered a pungent, slightly spicy flavor that was nicely neutralized by sweetness of the lightly fried potatoes. I have never been a fan of traditional condiments, but the mustard which accompanied the sweet potato tots was a surprising compliment, flirting with just the vaguest note of curry. The sesame-basil hummus was delivered on a spongy wafer, acting as a flavorfully subtle vehicle for the well-seasoned spread. 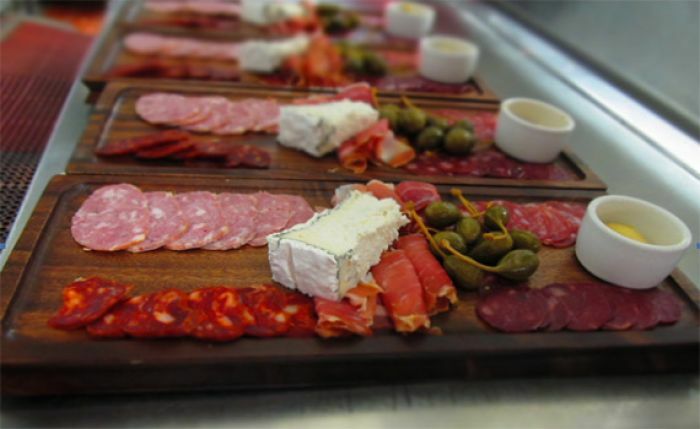 After enjoying a cocktail and a few rounds of appetizers, we were asked to sit down for our four-course dinner sampler, beginning with a charcuterie board containing exotic cuts of meat that included rich slices of duck sausage and an assortment of cheeses. 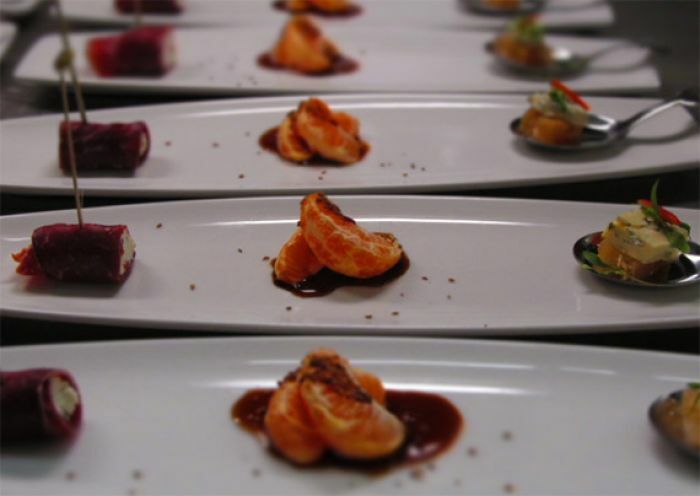 A glass of wine was followed by a pretty, palate cleansing plate offering a delicate assembly of tangerines in a wine reduction with anise, honeycomb cubes crowned with Spanish blue cheese, and stuffed bresaola with Boursin. 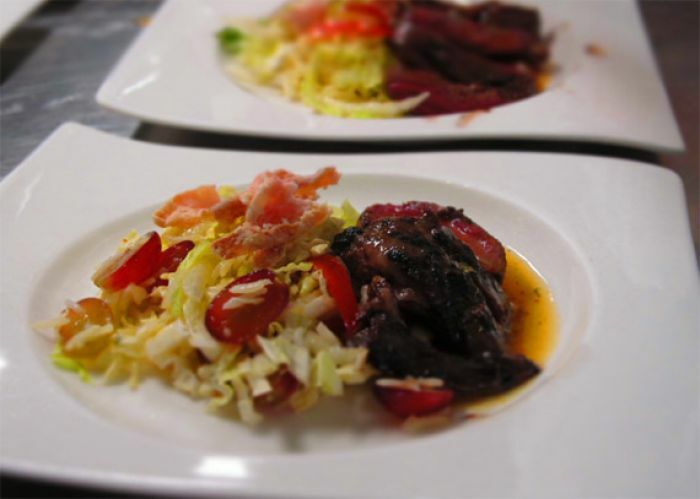 The bulk of the menu’s courses included a diverse blend of seafood and savory meats paired with international accents. 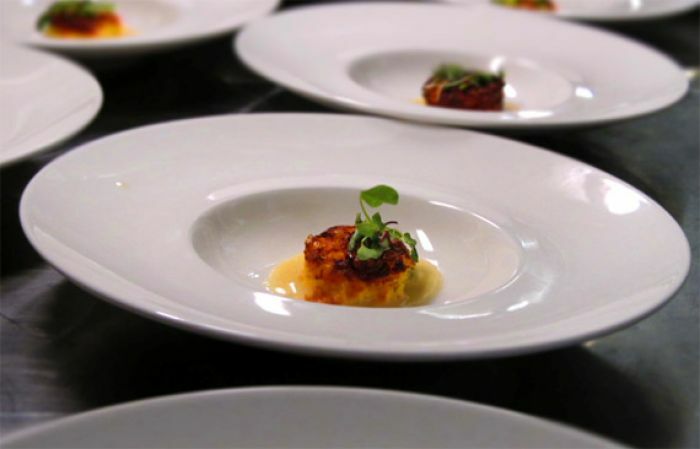 Chef Murphy strives to use local and sustainable fare whenever possible, such as the area sea urchin which was presented over a vanilla bean brulee of Ahi tuna, as well as the water Humphreys sources from Escondido-based company, Solar Rain. 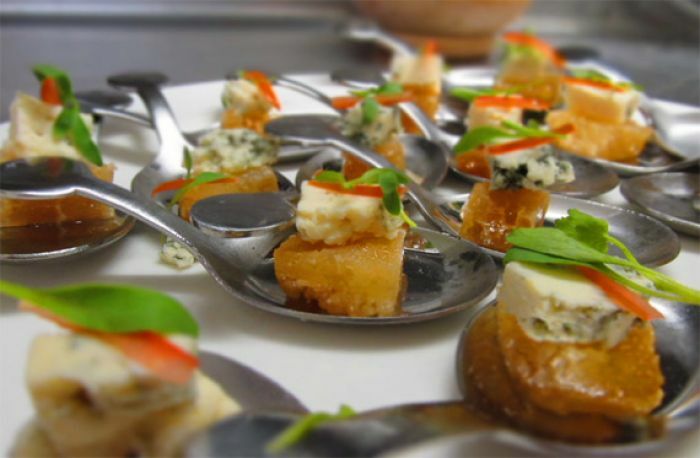 After desalinating ocean water, Solar Rain filters and cleans both the salt and water products, which, in addition to being served on the tables, is also used in Chef Murphy’s cooking. 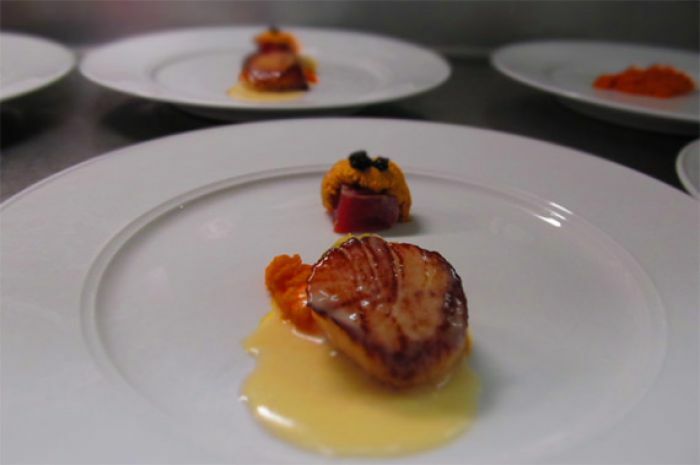 Among my favorites on the menu were the white corn soufflé, seared George’s Bank scallops in a sweet, cumin-infused carrot puree, and a ginger-honey marinated skirt steak. 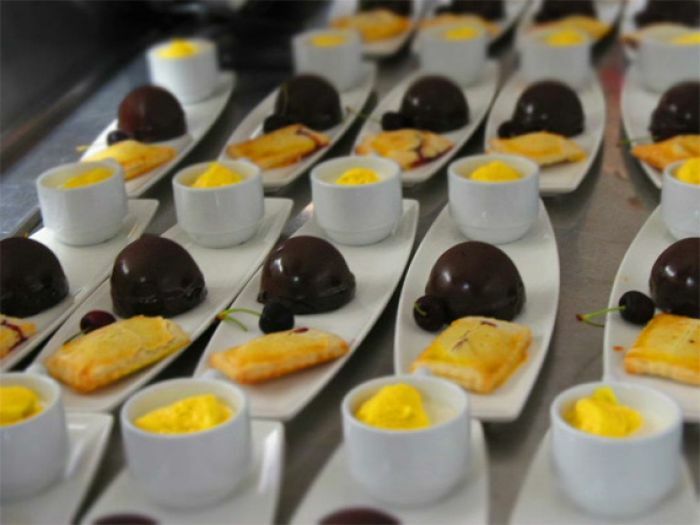 The meal finished with a trinity of desserts—mousse-filled chocolate bon bons, coconut panna cotta with passion fruit curd, and a cherry pop tart. While all were very good, the coconut panna cotta was especially delicious and did not survive the encounter. Alongside the restaurant’s wine selection and picturesque, San Diego location, the restaurant is a lovely dining atmosphere in which to enjoy a meal. Dining at Humphreys satisfies, quite well, Chef Murphy’s quest to combine diverse elements and to create a unique sensory experience. For reservations please visit HumphreysBytheBay.com.